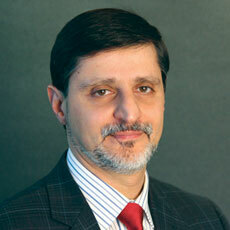 Majd Alwan, Ph.D., is a noted researcher and authority on aging services technologies. He also happens to be LeadingAge’s senior vice president of technology and executive director of the LeadingAge Center for Aging Services Technologies. He recently spoke with John Hall about the ways technology is changing the senior living landscape. Q: In his new book, “Third Wave,” AOL founder Steve Case asserts that the Internet will become engrained in everything we do, and entrepreneurs will vastly transform major “real-world” sectors such as health, education, transportation, energy and food — but success in the Third Wave will require a different skill set. In what ways do you agree or disagree with those assumptions or predictions as they apply to senior living tech? A: I agree with most of these predictions. However, I believe that in the senior living sector, we will still need high-touch care delivery skills, and I believe that we will need technical competencies to enhance these fundamental skills. I also believe that such skills are becoming first nature, or instinctive, with the younger generation joining the senior living workforce. We also will need people with skills in using dashboards, examining data from different sources and contextualizing the data to turn them into information and knowledge that drive care delivery processes and quality. Q: Is there a nexus right now where most tech innovation is coming from? Is it software? A: Most innovations are on the software side, but innovation is driven by the need for connectivity, having information at your fingertips at the point of care, mobility and being able to coordinate with others. Q: Is tech underdelivering or overpromising in senior living? • Having clarity on strategic direction, specific strategic goals and the enabling technologies. • Including proper planning and selection of the technology solution that engages all operations affected directly or indirectly by the technology, starting with understanding users’ needs, requirements and desires; a clear understanding of what the technology can or can’t do; and operational goals. The selection should not be based only on the technical specifications or functionalities, but also the service, operational, staffing, training and support needs. It is a multistakeholder team effort, and it is not the responsibility of the IT team. • Ensuring that the planning process includes understanding the IT infrastructure update needs. These steps should take place before a vendor is even identified. • Designing or redesigning workflows and operations to take advantage of technology. • Having a well-thought-out implementation plan with sufficient resources, including human resources for project management, implementation, training, system migration and support. The last two steps can be done collaboratively. You can have the exact same technology implemented differently in two very similar communities yielding drastically different results. CAST collected many success stories whereby the technology delivered results that exceeded expectations, but only because the provider had the right planning and implementation team, process and resources in place. Q: Is there any hesitancy among senior living operators to adopt technology? A: Senior living has been generally behind other sectors when it comes to technology adoption and technology spending, although I have seen signs of improvement in the past few years, particularly in certain technology categories. For example, electronic health records and point-of-care are starting to get adopted. I believe this adoption was driven primarily by the regulatory requirement to submit assessments (MDS, OASIS, IRF-PAI) and by billing information electronically to Medicare. Of course, the national health IT initiatives, CMS’ EHR adoption incentive program and emphasis on health information exchange have recently raised awareness, increased interest, and accelerated EHR development and standardization. Q: What overarching trends will shape future innovation, and adoption? A: I believe aging in place, and the corresponding growth in home- and community-based services, regulation, health and payment reform will continue to affect and drive future innovations. Connectivity, reliance on data, information and knowledge at the point of need will be the hallmark of innovation. But ultimately, adoption is going to be directly related to entrepreneurial spirit and foresight of providers, especially among leaders of aging services; and the usability and stickiness of the technology innovations brought to bear.